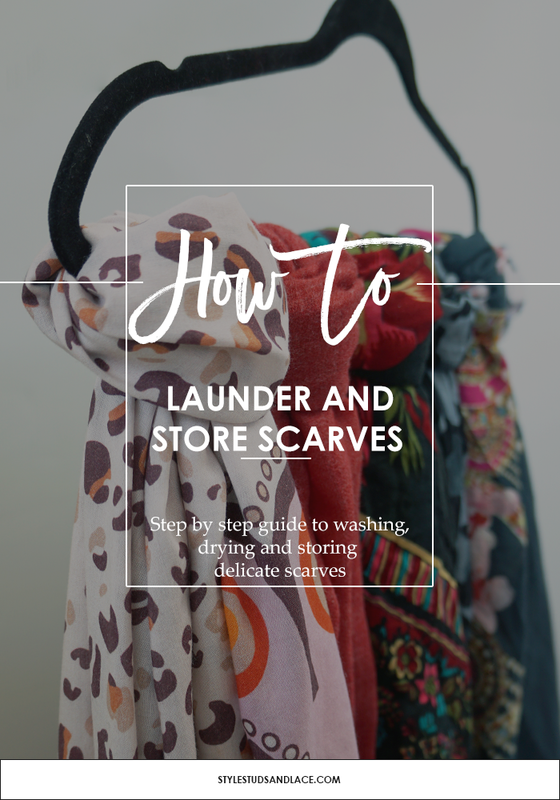 I’ve written a couple of posts sharing multiple different ways to tie a scarf (here and here) so I thought I’d follow on from this by telling you my tips on looking after and storing scarves. It’s not always necessary to wash scarves, often hanging them outside on a breezy (preferably a cloudy) day is enough to freshen then up. If you must clean them then the best advice I can give you is to always read and follow the instructions on the care label, and if it says dry clean only (the symbol is a p inside a circle) then please do as instructed. But if you’re washing them yourself and the limited instructions on the care label have you wondering what to do then this post should help. 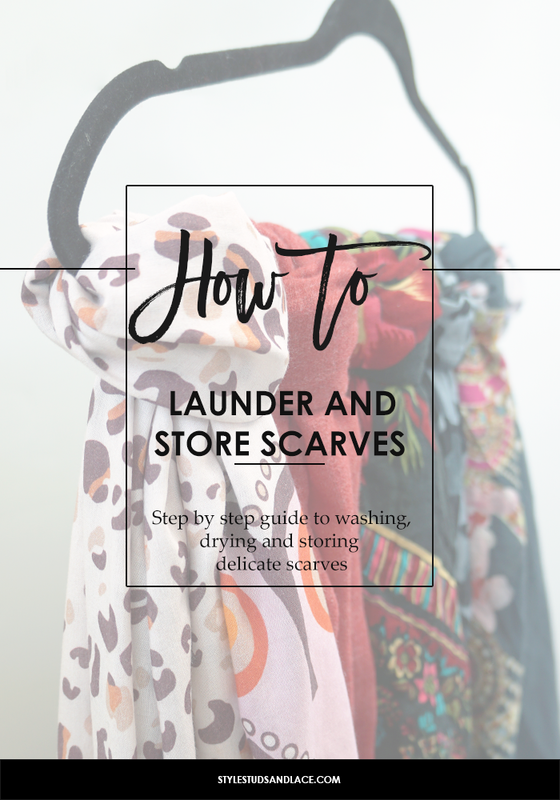 It shares more in depth information about how best to wash, dry and press your scarves, as well as how to store them. Dry cleaning is often the best option for silk, especially lightweight delicate silks. Fill a bucket or sink with cold water and add a specialty detergent such as Woolite. Gently swirl your scarf under the water for two minutes, then rinse by submerging it in clean cold water. Some people swear by adding a dash of vinegar to the water to remove the soap suds and restore shine but I’m yet to try this. 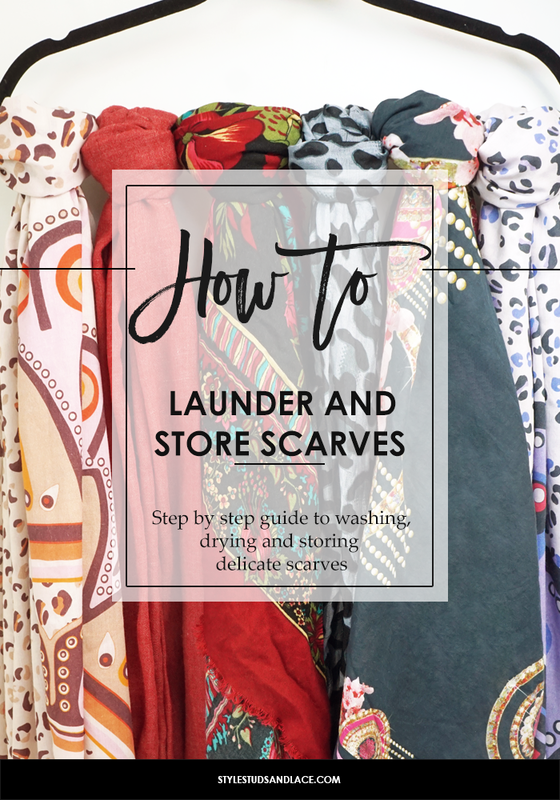 To dry your scarf, lay it out on a towel, fold the towel in half and press down gently to remove excess water – never spin dry it and avoid wringing it out as this will damage the fibers and distort the shape. Hang your scarf out of direct sunlight and allow to dry naturally. The best way to remove wrinkles or fold lines is to lightly steam them but if you don’t have a steamer and wish to use and iron, do so on the back of the scarf placing a protective ironing sheet or pillowcase over the fabric too protect it. Iron on the silk setting (or if you don’t have that just keep it on the lowest setting) to avoid burning the material and empty the iron of all water so you don’t accidentally leave watermarks. If you get a little dirt spot on the scarf don’t attempt to spot clean its a sure fire way to leave a mark or small faded patch. Wash the entire scarf instead. Use a cold water and a wool/cashmere friendly detergent. Leave the scarf to soak for around 5 mins, gently swirling it from time to time. Then rinse with cold water until the water runs clear. Some people swear that a dash of vinegar added to the water helps to remove the soap suds and restore shine but I haven’t actually tried this myself. Remove from the water and gently squeeze out the water as you do so. Lay it flat on a towel, roll, and gently squeeze to remove the excess water. Unroll and leave the scarf to dry flat. Don’t be tempted to use a fabric softener as this may leave a coating on the scarf that will actually make it less soft. A steamer is the best way to remove wrinkles but to be honest I rarely feel the need to do this – most creasing drops out eventually. Admittedly these are less delicate then silk, wool and cashmere, but I tend to treat them as if they are just as delicate and always choose hand washing over machine washing as it is much kinder to the fabric and the print. However, if you choose to machine wash then do so with caution and choose a delicates setting and a low temperature. I’d recommend using a laundry bag, especially if your scarf has tassels or frayed edges that are prone to knotting. Spin drying can distort the shape of the scar so hang them up and let them dry naturally instead. Cotton, modal and rayon can all be ironed but I prefer to steam my scarves as it’s gentler on the fabric. Please treat the information above as a guide and if you are worried then I suggest you seek the advice of a professional cleaner. Never store your scarves in plastic as this traps water and doesn’t allow fabric to breathe, which in some cases can cause fabric to yellow. 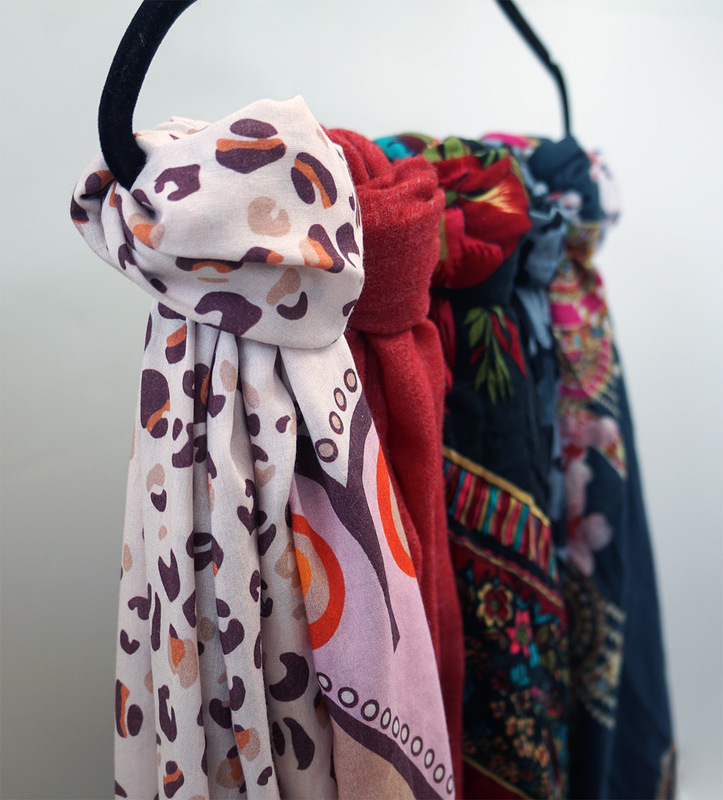 Store your scarves in a place where there is no direct sunlight otherwise you may find the colors fade. It’s also a good idea to avoid places that are prone to damp. I roll all my scarves and store them in a fabric box on a shelf in my closet, it’s dark, dry, and I can easily pull the box out to see what I have. And it’s a simple tidy solution that takes little time to do! I also pop a little sachet of moth repellent in with the scarves to protect them from being eaten. 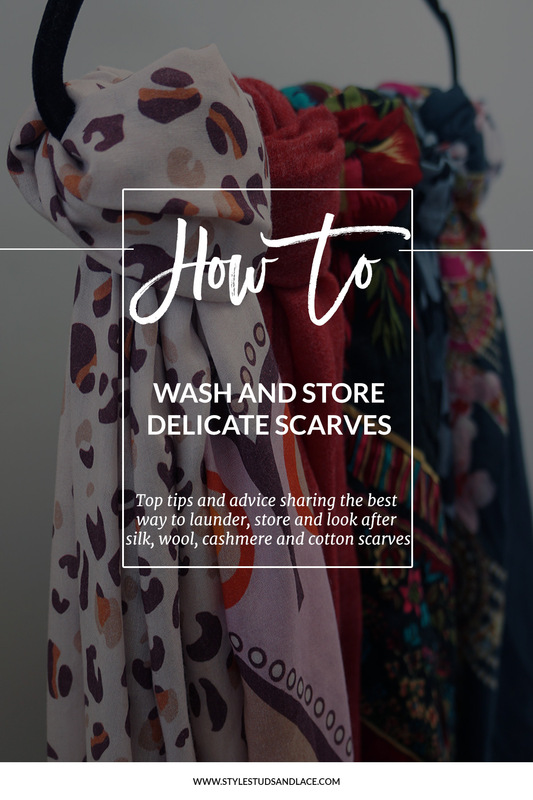 Delicate fabrics snag easily so be careful handling scarves when you’re wearing jewelry. I always put my scarf on before I put my rings and bangles on. If you enjoyed this post and are looking for some ideas on how to tie your scarves, you should check out these two posts I wrote: This one shares three great ways to tie a square scarf, and this one illustrates a few ways to tie a long, oblong scarf!